Restoring default config on iPhone MobileTerminal. I see this issue/question posted quite a bit, and after helping several people on various forums… I thought this might help others too. 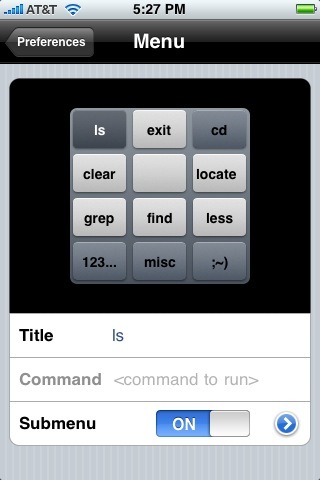 If you’ve used MobileTerminal on your jailbroken iPhone, then you should be aware of the customization possible. More specifically: customization relating to the command shortcut menu. While customizing this and other menus, it’s very easy to accidentally wipe out an entire submenu! The best example I can think of would be picking say the “ls” submenu, and then accidentally hitting off on the submenu instead of the right arrow to modify it. Another common menu to wipe out is the “misc” menu. Never fear though, you can still access the configuration menu by taping the AT&T or iPod logo in the upper left corner. rm -rf /private/var/mobile/Library/Preferences/com.googlecode.mobileterminal. * The case is sensitive, so type that in exactly as posted. Restart MobileTerminal and you should be good to go. Consequently, that’s what you’d also want to backup if you were about to blow away your iPhone and wanted to keep your tricked out MobileTerminal preferences.